No, really, I LOVE this show. How does Jack always manage to save the day? Are you about to be shot by a terrorist? Jack will save you. Being chased by a criminal on the streets? Don’t worry, Jack’s got that covered. He’s just about to swing by and pick you up in his SUV in about 3 seconds. Are you being tortured by people who have an exceedingly large bag of torture devices? No problemo! Jack will save you and bite the neck of your torturer to allow you to escape and run free. Jack flies into the kitchen, and puts out the fire with a fire extinguisher and his rippling arm muscles. Jack grabs meat man by the collar and sternly warns him that if he e-v-e-r frequents my doorstep again, he will seek him out and make his life a. living. hell. Jack lifts the cabinet with one arm and vacuums under it with the other. Sheer strength. And he doesn’t break a sweat. Situation: Daycare calls, my son is sick and needs to be picked up and I am in the middle of a conference call. Jack: “I’ll call CTU and have a tac team pick David up with a medical doctor and he will be home in no time”. Jack: “I know people that can help you, I’ll make a call… just… trust… me”. Jack: “Let me get Chloe on the phone. ‘Chloe, can you pull up the schematics for a “Dinosaur Kingdom” and use the satellite to get the coordinates for the nearest Home Depot, I think I need an allen wrench for this one'”. See? See how much Jack can help? Well, you can’t have him. 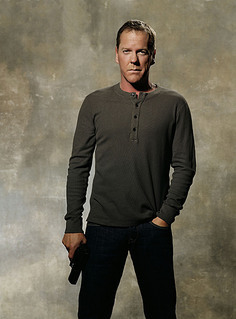 After he is retired with the TV series, he’s mine. Of course, you are free to visit me to have lunch on the porch. Jack grills a mean burger too…. Too bad there are no “Real” Jack Baur’s. We could really use one about now! Jack is my hero! First, don’t let them take David to CTU Medical…no one ever comes out of there alive.Second, don’t forget that Chloe would need to send the schematics to Jack’s PDA! You could add being trapped on an airliner on the runway in bad weather for 10 hours to your scenarios.It truly IS a great show.